In his urgent new book, T. J. Coles uncovers the forces seeking to uncouple Britain from the European Union. Allied to an expanding core of free market fanatics in the Conservative party is a powerful group of globalists and financial traders. Their political ideology is neoliberalism – a worldwide agenda that seeks to deregulate markets and maximize profits for global elites at the expense of working people. The effect is a growing gap internationally between rich and poor. 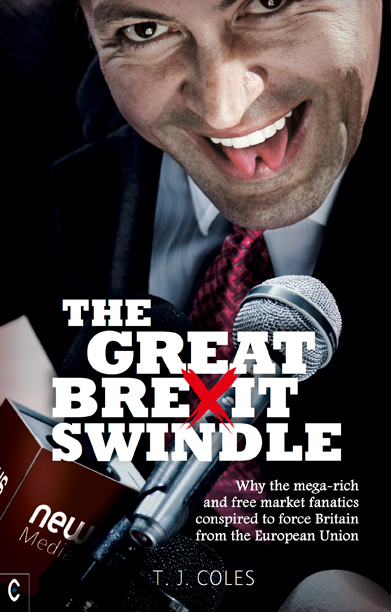 Digging deep into the funding campaign, The Great Brexit Swindle documents the potent, self-serving interests behind Brexit. In the wake of the financial crisis of 2008, mega-rich hedge fund managers and billionaire CEOs are keen to be rid of Brussels and its ‘red tape’ regulation. Their anti-European political allies, meanwhile, are preparing to corner markets in Asia and South America, whilst expanding Britain’s military capacity as a back-up to economic penetration. Brexit was sold to the public as a once-in-a-lifetime opportunity to regain sovereignty, control immigration and increase the nation’s wealth. But, despite the manifold promises of Brexiteers, Coles demonstrates that economic globalization will lead to growing job insecurity and greater immigration, once British workers are put in direct competition with the huge, poor populations of countries like Brazil, China, Mexico and India. Increasing ‘free market’ trade worldwide leaves Britain open to low-quality products, such as hormone-treated American beef and genetically-modified foods, whilst the new planned trade agreements would only accelerate the privatization of public services. Although Coles is not an advocate for the EU, he argues that the Brexit agenda is designed only to serve the interests of the wealthy and increasingly powerful 0.1% of the population. T. J. COLES studies the philosophy of neurology and cognition at the University of Plymouth, UK, with reference to the aesthetic experiences of the blind and visually impaired. He is director of the Plymouth Institute for Peace Research (PIPR) and author of Britain’s Secret Wars (2016), The New Atheism Hoax (2015) and editor and co-author of Voices for Peace (2015). His political writings have appeared in the New Statesman, Lobster, Peace Review, Z Magazine and axisoflogic.com. He was shortlisted for the Martha Gellhorn Prize for journalism in 2013.